Explore, Learn, Have Fun! : This CrAzY life o' mine! Tomorrow, the kids and I head to South Georgia to visit my Nana. She is 88, will turn 89 in about 2 weeks. I ADORE HER. I wish we weren't 4 hours apart, because it is really hard to find time to get there more often. We haven't been since June. And probably won't get there again after this trip til after the first of the year. So we are going to do a one day marathon trip - driving down early (6 am departure, then come home around 5 or 6 pm) that gives me 6 or 7 hours with her. I take my notebooks, my video camera and my camera for pics, story telling, and taking lots of notes. She grew up during the depression, and has so many good stories to share. I wish we could spend so much more time together, so every trip down there is PRECIOUS!! Today I gathered books, some treats, and other items to take down for her. My mom baked us mini lemon cupcakes with lemon glaze and lemon buttercream to take and share - mmmmmm - are they ever delicious! My husband has work Monday, so he won't be going this time. The kids don't have school Monday, so we can sleep in that day! I'm really excited to be going down even if it is for such a short time, because I need a Nana hug!! UPDATE: We had a great (but much too short) visit with Nana & saw several other family members. It was a great time - just wish we could have stayed longer. 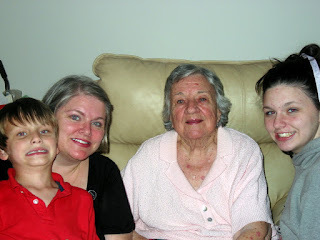 Here's a pic of me with Nana and my kiddos from 10-10-10! hug 'em and love 'em while they are still with you! I miss my grandparents so much every day. Safe travels, Aimee!